MONOI means "sweet scented oil" in Reo-Maohi, the ancient language of the Polynesians. 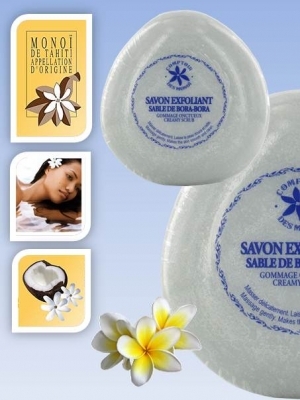 Monoi de Tahiti products arre all based on the secret of combining coconut oil with Tiare blossoms. Formulated with Bora-Bora white sand, this new soap with lagoon fragrance offers a gentle exfoliation, and will be particularly appreciated for its purifying, moisturizing, and smoothing properties.This soap with lagoon refreshing fragrance gives an intense body exfoliation. Its moisturizing and smooth powers are brought by the perfect combination of white sand from Polynesians turquoise lagoons and Monoï de Tahiti. Your shower will become a true travel in the Islands, refreshing and smooth thanks to its light and fragrance lather that will leave your skin soft and clean. Sodium palmate, Sodium palm kernelate, Aqua, Calcium carbonate, Perfume, Cocos nucifera oil, Elaeis guineensis oil, Sodium chloride, Glycerin, Tetrasodium EDTA, Tetrasodium etidronate, CI77891, Gardenia tahitensis flower, CI77007, Tocopherol, Benzyl alcohol, Benzyl salicylate, Citronnellol, Coumarin, Geraniol. Apply daily to all the body after the bath or the shower, or after any sun exposure. Make it penetrate with light circular massages. Its soft, smooth and rich texture is designed for all types of skin, including very dry and sensitive. This product is manufactured in France in accordance with the French Government Decree Nr. 92-340 amended by Decree Nr. 313/CM dated 20/02/2008; published JOPF Nr. 2008-9 dated 28/02/2008, which strictly defines the process used to manufacture Monoi de Tahiti, guaranteeing its authenticity and quality. .